As agreed by China and Pakistan, the first China-Pakistan Foreign Ministers' Strategic Dialogue will be held in Beijing on March 19. State Councilor and Foreign Minister Wang Yi and Pakistani Foreign Minister Shah Mahmood Qureshi will co-chair the dialogue. Q: The Foreign Ministry announced this morning that President Xi Jinping will pay state visits to Italy, Monaco and France. Could you give us more details on the visits? What is China's expectation? A: At the invitation of President of the Italian Republic Sergio Mattarella, head of the Principality of Monaco Prince Albert Ⅱ and President of the French Republic Emmanuel Macron, President Xi Jinping will pay state visits to these three countries from March 21 to 26. During his visit to Italy, President Xi Jinping will hold talks with President Sergio Mattarella and Prime Minister Giuseppe Conte and meet with President of the Senate of the Republic Maria Elisabetta Alberti Casellati and President of the Italian Chamber of Deputies Roberto Fico, and the two sides will exchange in-depth views on China-Italy and China-EU relations and international and regional issues of mutual interest. 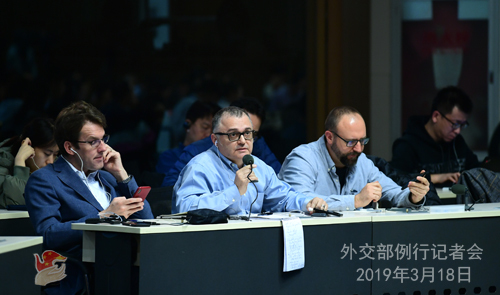 This year marks the 15th anniversary of the China-Italy Comprehensive Strategic Partnership and the bilateral relations are developing with sound momentum. President Xi Jinping's visit this time is the first visit to Italy by a Chinese head of state in a decade, which will add new dimensions to the China-Italy relations and is of important significance in building on the past and opening up the future for the bilateral relations. 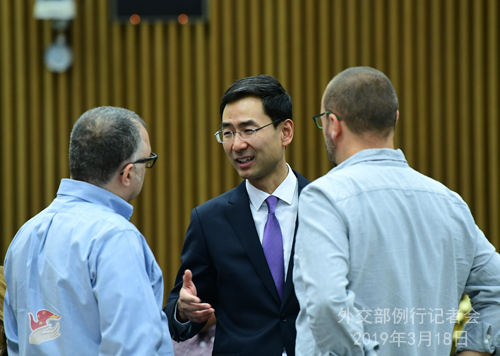 We believe this visit will further consolidate the political mutual trust between the two countries in the new era, deepen across-the-board practical cooperation under the Belt and Road, expand cultural and people-to-people exchange and mutual learning and work for new progress in the China-Italy Comprehensive Strategic Partnership in the new era and contribute to promoting China-EU relations and world peace and development. During his visit to Monaco, President Xi Jinping will hold talks with Prince Albert Ⅱ and they will exchange views on the development of China-Monaco relations in the new era and other issues of mutual interest. This will be the first ever visit to Monaco by a Chinese President and it is of historical significance to the development of China-Monaco relations. We stand ready to work with Monaco to deepen political mutual trust and across-the-board cooperation and exchange, move forward China-Monaco relations and continue to set an example of friendly relations and win-win cooperation between countries of different sizes. During his visit to France, President Xi Jinping will hold talks with President Macron and meet with French Prime Minister Edouard Philippe, President of the National Assembly and Speaker of the Senate. The leaders of the two countries will exchange in-depth views on the China-France relations, China-EU relations and major international and regional issues of mutual interest. France is the first major Western country to establish official diplomatic ties with China. The China-France relations have always been at the forefront of China's relations with Western countries. The China-France relations continue to grow with sound momentum, as evidenced by frequent high-level visits, continuous new progress and breakthroughs in practical cooperation and deepening cultural and people-to-people exchange. The two sides also maintain close communication and coordination in upholding multilateralism, improving global governance, coping with climate change and other major issues. President Xi Jinping's visit this time is the first visit to France by a Chinese head of state in five years. This visit is made as the two sides celebrate the 55th anniversary of the establishment of diplomatic ties and is of special significance to the bilateral relations. China always attaches strategic importance to China-France relations and stands ready to work with France to take this opportunity to deepen political mutual trust, open up new prospects for practical cooperation and cultural and people-to-people exchange, and elevate the close and enduring comprehensive strategic partnership to a new height. Q: A follow-up question on President Xi Jinping's visit. Can you tell us precisely which day he will arrive in France and which cities he will visit? A: I've told you all what I can tell you. Q: You just mentioned that Pakistan's foreign minister has arrived for a dialogue with State Councilor and Foreign Minister Wang Yi in China. I presume that India-Pakistan tensions following the terror attacks in the India-controlled Kashmir will be part of the discussions with the Chinese interlocutors. Since China has already declared that it wants to play a role of facilitation between India and Pakistan, what do you think can be the follow-up steps to this visit? A: Like I just said, on March 19, that is tomorrow, State Councilor and Foreign Minister Wang Yi and Pakistani Foreign Minister Shah Mahmood Qureshi will co-chair the first China-Pakistan Foreign Ministers' Strategic Dialogue in Beijing. The two sides will exchange views on China-Pakistan relations and international and regional issues of mutual interest. As you said, tensions have arisen in this region recently and the two sides will surely talk about this in the dialogue. I would like to say that as a friendly neighbour of India and Pakistan, China has actively promoted peace talks and played a constructive role in easing the recent tensions. China will continue to encourage India and Pakistan to meet each other halfway, resolve differences through dialogue and jointly uphold regional peace and stability. Q: You mentioned the dialogue with Pakistan. We know that China has invested a big sum of money through its Belt and Road Initiative and other programs in predominantly Muslim countries around the world. And yet compared to the West, we often hear less criticism if not any criticism at all from predominantly Muslim countries over China's treatment of Muslims in Xinjiang. Is China using these investments to buy the silence of Muslim countries? A: The mutually-beneficial cooperation between China and relevant countries, especially that under the Belt and Road Initiative, follows the principle of consultation and cooperation for shared benefits and all participants have taken part in it on voluntary basis and benefit from that. This has nothing to do with the attitude of these countries regarding the Xinjiang-related issues. As for China's position on Xinjiang-related issues, we have made it clear on many occasions. The measures the Chinese side has taken in the Xinjiang Uighur Autonomous Region are for preventive counter-terrorism and de-radicalization purposes, on which the international community has fair judgment. The resolutions adopted by the meeting of the Council of Foreign Ministers of the Organization of Islamic Cooperation not long ago have demonstrated that fairly. Q: There are rumors about a possible meeting between Pope Francis and President Xi in Rome while he is in Italy. Are you in contact with the Vatican? Can you give us some confirmation about it? A: I am not aware of that. China remains sincere as always about improving relations with the Vatican and has made unremitting efforts in this regard. In September 2018, China and the Vatican signed a temporary agreement on the appointment of bishops, a landmark in the improvement of relations. China stands ready to work with the Vatican to meet each other half way and enhance understanding and accumulate mutual trust through constructive dialogue to achieve greater progress in the improvement of relations. Q: On March 14, India and Pakistan held the first meeting on Katarpur Corridor and discussed clauses of an agreement on Indian pilgrims traveling through the corridor to Pakistan. Some commentaries say that this was the first official face-to-face meeting between the two sides for a while and is therefore of symbolic significance for the easing of relations. What's your comment? A: We welcome this latest interaction between India and Pakistan and hope it will help further ease bilateral relations and contribute to improving the regional situation. India and Pakistan are neighbors that cannot be moved away. Good neighborly relations serve the fundamental interests of both countries and are the common aspiration of the international community. We hope they will continue to show goodwill, meet each other half way, properly handle differences through dialogue, work for improvement of relations and jointly safeguard regional peace and stability. Q: Releasing the US State Department's annual human rights report titled Country Reports on Human Rights Practices, US Secretary of State Michael Pompeo said that China is in a "league of its own" when it comes to human rights violations. How do you respond to that? A: China firmly opposes such groundless accusations and has made stern representations with the US side. 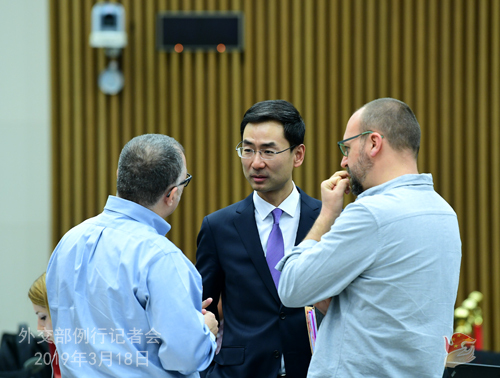 As to how China's human rights situation is, the Chinese people is in the best position to pass a judgment and most members of the international community also have a correct view on that. Last Friday, the UN Human Rights Council adopted China's report on its third Universal Periodic Review in a smooth process. Head of the Chinese delegation and Vice Foreign Minister Le Yucheng expounded on China's human rights development path, ideals and practices, informed the Council of the latest progress on the 30 new measures China announced during the review process last year, and made further response on Xinjiang-related and other issues. The session spoke highly of China's human rights achievements, commended the open, confident and candid attitude China demonstrated during the whole process, welcomed the serious and responsible feedback China gave to the recommendations it received last November, and decided to adopt China's national report. This fully demonstrates that China's human rights development path, achievements and determination to promote human rights situation have won wide recognition of the international community. I would like to remind you that out of 346 recommendations, China accepted 284, or 82% of the total, that suit its national conditions and are conducive to China's human rights development. The sheer number and proportion placed China ahead of many other major countries. This showcases China's determination to protect and promote human rights and that the Chinese people honors its words and acts on its promises. I want to add that it is an invaluable quality for a man to "know thyself". As a country that has pulled out of the Human Rights Council with its own stained record of human rights, it has been pointing fingers at other countries' human rights conditions year after year. I have to say that this country must be feeling so good about itself that it failed to see how other countries are repelled by its words and actions. We hope that this country can do some serious reflection and adopt a correct attitude when handling human rights issues and conducting human rights dialogue and cooperation. Q: The DPRK Vice Foreign Minister Choe Son-hui recently said that US officials obstructed the constructive efforts of the two leaders and that if the US does not change its way of negotiation, the DPRK has no intention to continue. What's your comment? A: We have noted the remarks by Vice Foreign Miniser Choe Son-hui of the DPRK as well as the US response expressing hope for continued dialogue and negotiation on denuclearization. I'd like to point out that after the Hanoi Summit, both the US and the DPRK expressed readiness to continue dialogue. China applauds and encourages their attitude. It is China's consistent position that the Korean Peninsula issue can only be resolved peacefully through political dialogue. The key to keeping up dialogue and making progress is to accommodate all parties' legitimate concerns in a balanced way and follow a phased and synchronized approach with a package solution, starting with the easier tasks and then advancing progressively. As State Councilor and Foreign Minister Wang Yi pointed out at the press conference during the Two Sessions, as the nuclear issue has dragged on for decades and complicated factors are at play, one cannot expect it to be solved overnight. All parties need to have reasonable expectations. One shouldn't set the bar too high at the outset or make unilateral, unrealistic demands. We hope the DPRK and the US will cherish and safeguard the hard-won momentum for dialogue, seize the opportunity, meet each other half way, accumulate mutual trust and consensus, stay in the course of dialogue and strive for positive outcomes leading to peace on the peninsula. The international community should encourage both sides to keep moving in the correct direction of denuclearizing the peninsula and establishing a peace mechanism. China stands ready to contribute to this goal by playing its due role. Q: According to reports, the meeting between President Xi and President Trump is likely to be pushed back. Do you have any updates on the progress of setting up a summit between the two leaders? Do you have anything to say about that? A: If I remember it correctly, my colleague already responded to that last week, and I have no updates to that. I would like to reiterate that we noted that recently President Trump said on many occasions that he is looking forward to meeting with President Xi Jinping again. President Xi also said in his message to President Trump that he will maintain close contact with President Trump through various means. Q: US Assistant Secretary of State Tibor Nagy said recently during a trip to Uganda that the effects of China-Africa cooperation is being over-exaggerated. US input in good governance and security in Africa far outstrips that of China and yet has not received much attention. In contrast, stadiums built with Chinese assistance got a lot of attention from the public in Africa, which is very annoying. China's loans increased Africa's debt burden and Chinese people are stealing business and jobs from the local people. What's your comment? A: We noted that recently US officials, one after another, made many irresponsible remarks on China-Africa cooperation during trips to Africa. Such groundless accusations filled with cold-war mentality is typical sour grapes and reflects a deep-seated zero-sum game mindset of some in the US. I want to point out that these flawed allegations based on anything but facts will find no audience at all in Africa. The long-standing China-Africa friendship has withstood the test of time and changing international landscape and stands as a towering tree that no force could topple. In advancing cooperation with Africa, China is committed to the principle of sincerity, real results, amity and good faith and always pursues the greater good and shared benefits. We have Africa's development and African people's welfare at heart and never seek selfish political gains. We put our strengths and resources where Africa needs them most. When providing financing options to African countries, China always respects their will, bears in mind the local conditions and puts great weight on the economic and social impact of projects. Through such means, China has contributed significantly to African countries' endeavor to achieve self-reliant sustainable development. As we speak, China-Africa cooperation is yielding fruitful results all across Africa, bringing tangible benefits to every aspect of local people's lives. It is these people who are in the best position to judge the effects of China-Africa cooperation projects. Today, what Africa needs least is a grand lecture by someone that dictates to them what should or should not be done. What it needs is sincere cooperation between partners. As a matter of fact, many state leaders and people in Africa have stepped up to refute those blaming China for Africa's debt issues. We advise the US officials visiting Africa to listen to the voices of Africa and help Africa through concrete actions. 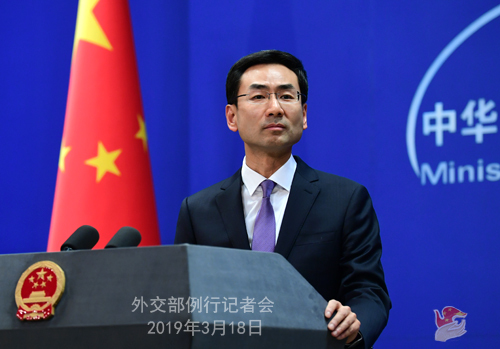 Q: Further to what you said about Pakistani foreign minister's visit, the Chinese Ambassador to New Delhi yesterday expressed positive impression about the issue of the listing of the particular militant leader for the Jaish-e-Mohammed, saying that this matter will be resolved. So is that going to be figured in the talks between the two foreign ministers tomorrow? A: I'm not getting ahead of the China-Pakistan Foreign Ministers' Strategic Dialogue regarding the specific agenda. But like I just said, the dialogue will surely involve China-Pakistan relations and international and regional issues of mutual interest. The India-Pakistan relations and the recent tensions in this region will surely be among the topics in the dialogue. As for the listing issue you mentioned, I believe you know China's position very well and I'm not going to repeat it. I would like to stress that China will continue to handle this issue in a constructive and responsible manner, and will stay in close communication with relevant parties including India and Pakistan. Q: Italy is planning to endorse the Belt and Road Initiative, but it seems that on the US side, there is still a strong pressure to stop this. So what's your comment on this? A: My colleague already replied to similar questions last week. I would like to stress that the cooperation between China and Italy under the Belt and Road are mutually beneficial and win-win. We hope and believe that Italy will make the right decision and choice based on its own interests. Q: The Chinese Vice Foreign Minister Kong Xuanyou has earlier visited Pakistan. Is there any proposal of his visit or any other senior Chinese official's visit to India? A: China and India have maintained close diplomatic communication. If there is such a visit, we will usually release the information in a timely manner. Q: Just would like to ask you if you can confirm President Xi Jinping will visit Palermo during his state visit in Italy? A: I just briefed you on President Xi's upcoming visits to the three European countries. I have no more details to offer regarding the visits at this moment. A press briefing will be held at 9:00 a.m. on Wednesday, March 20 in the MFA Press Hall (Lanting, South Building). 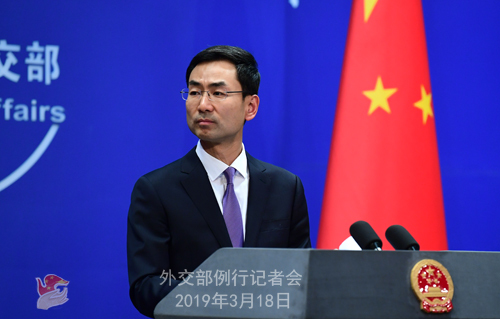 Vice Foreign Minister Wang Chao will brief on President Xi Jinping's state visits to Italy, Monaco and France and answer questions of the press. Your attendance will be most welcome.